Is my Child Ready to be Out of a Booster Seat? Is my child ready to be out of the booster? The child must be 8 years old to even consider leaving the booster. The child must pass the 5 step test to get out of the booster. The belt must fit them correctly. This test checks for belt fit. Does the child sit all the way back against the vehicle’s seat? Is the lap belt below the stomach, touching the thighs? Is the shoulder belt centered on the shoulder and chest? 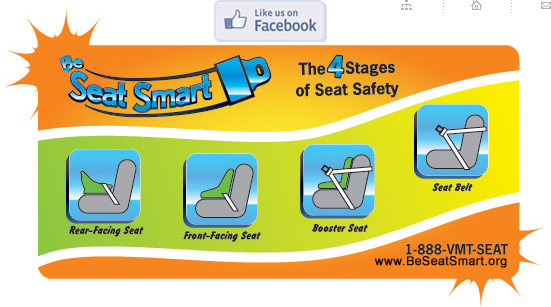 With feet on the floor, do the child's knees bend comfortably at the edge of the vehicle's seat? Can the child stay seated like this for the whole ride? If the answer is “no” to any of these questions, the child needs a booster seat in order for the shoulder belt and the lap belt to fit properly and provide the best crash protection. A child may pass this test in one vehicle but not in another. This is due to the different configurations of seat belts, where they attach to the wall and vehicle seats. The child should remain in a booster in the second vehicle until he or she can pass the test in that car.